Alena Eckhardt brings more than a decade of wide-ranging litigation experience to her practice. Her expansive admiralty and maritime practice includes defending vessel owners and their underwriters in personal injury and property damage claims, maritime liens and replevin, cargo claims and subrogation. 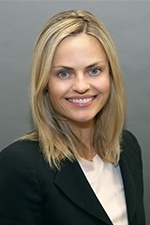 Alena has also represented clients in matters involving fires in marinas and aboard vessels, salvage claims and pleasure boat accidents, maritime and environmental casualties, as well as insurance coverage, transportation law, product liability matters, and a wide-range of commercial disputes. Having defended and prosecuted matters in both state and federal courts at pre-trial, trial and appellate levels, Alena provides her clients with a wealth of knowledge, ensuring they're prepared for each phase of litigation. Prior to joining Hinshaw, Alena practiced at a Los Angeles-based maritime law firm. She also worked at maritime firms in Florida, where she began her legal career. While pursuing her LL.M., Alena was a recipient of the Richard J. Peppin Scholarship. She also served as an Administrative Law Judge for the City of Portland and spent a semester as a research fellow in Zürich, Switzerland.